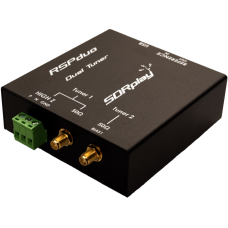 The RSPduo is a radical new addition to the range of SDRPlay's RSP SDR Receivers, featuring dual independent tuners which are both piped though a single high-speed USB 2.0 interface. A full featured 14 bit SDR Receiver, the RSPduo covers the entire RF spectrum from 1 kHz to 2 GHz giving 10 MHz of spectrum visibility. Initially using Windows-based ‘SDRuno’- free Software supplied by SDRplay- you can simultaneously monitor two completely separate 2 MHz bands of spectrum anywhere between 1 kHz and 2 GHz. The Receiver comes fully assembled and tested and requires a Personal Computer, one of the SDR Receiver Application programs as well as a suitable antenna. When used together with SDRplay’s own SDRuno SDR Software, the RSPduo becomes a high performance SDR platform. Enclosed in a rugged black painted steel case. Package Contents: 1 pcs SDRplay RSPduo with "Getting Started" information. Note: The SDRPlay RSPduo requires a standard USB-A plug to USB-B plug Cable. This USB Cable is NOT supplied with the RSPduo as the majority of buyers will already have such a cable available. The SDRplay RSPduo comes with standard 12 month warranty, except for those EEC Countries where Local Legislation provides for additional warranty terms. SDR-Kits as a UK Distance Seller complies with the local EEC legislation. SDR-Kits warranty includes parts and labour and the cost of return shipping, provided the product has not been misused. Specifically the RF Power applied to the RSPduo Antenna socket should be limited to a maximum of +10dBm to avoid damage to the RSPduo. The RSPduo is available from stock - we ship within 48 hours via Registered Post / Tracked Airmail.